Just to warn you, this post is not about training or sports, although it still applies to athletes. It’s about hand hygiene. Whilst driving my friend around the area yesterday, she could not help but point out the number of small containers of hand sanitizer I had sitting between the passenger seat and drivers seat in my car. There must have been a sale at Bath and Body Works for travel sized hand sanitizers, and I got carried away, hence why I have so many in my car. I cannot help it; the overuse of hand sanitizer was instilled in my brain when I started nursing school. I’ve seen that children in schools have sanitizer attached to their backpacks (it’s a good thing, kids are learning disinfection techniques). And, I admit, when I traveled in areas of Africa where the water is the source of bacteria, alcohol-based hand sanitizers were what I relied on, and were a God-send. But in this country, the good old U.S. of A., I fear this use of sanitizer is taking over the importance of simple hand washing. So what’s with this fad of waterless hand sanitizers? What are the benefits of the water-less, germ-busting gel that seems to clear your sinuses when you take a whiff? 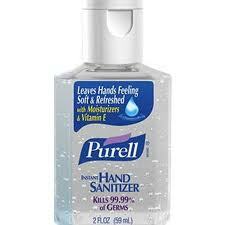 One clear benefit is the fact there is no water needed when you use hand sanitizers. I remember when I was younger having alcohol wipes in my lunch box, and the fact they had different scents was an amazing thing. Hospitals now have waterless sanitizing gels outside every patient room (or should), with the hope people going in and out of the rooms will use it. But as much as you wish the Purell will kill every little bug on your hand (why shouldn’t it? It’s advertised to kill 99% of bacteria…even organic, “non-toxic” varieties of hand sanitizers), it still is not as good as using soap and water. Yes, I am writing a post about handwashing. I hope you learned in pre-school and at home how to properly wash your hands. Yet in orientations to healthcare professions, there are still demonstrations on how to wash your hands correctly. Okay, I am not quite OCD about hand hygiene, but I come close. I think that with the overuse of hand sanitizers people are not washing their hands with soap and water as much as they should. There is still that 1% of bacteria which is not killed by Purell. And one nasty bug that resides in that 1% is Clostridium Difficile–aka C.Diff– a normal bacteria found in your gut but can cause extreme diarrhea if it gets out of hand, and is NOT washed off your hands by sanitizer. C.Diff spores can live on surfaces for up to 5 months, and the true, known way to clean it off is by the old fashioned soap and water. Moisten your hands with warm (not scalding, not freezing) water, squirt some soap into your hands and lather up a storm. It’s not that difficult, and takes less than a minute to do. Still, I cannot TELL you how many people I come across who clearly have not washed their hands recently. I will never forget the time I spent in an emergency room (i am not naming names, but it was in a developed country) when the doctor completed a procedure involving sutures and open wounds on a family member and he did not wash his hands. The thought still makes me cringe. Please, I’m asking of you, teach your youth, or friends for that matter, how to wash their hands with water and soap, and not to rely on Purell. Yes, the waterless gels are a good for traveling in third world countries and areas where you will not have a good reliable water source, and I do suggest taking some along if you are unaware of what your availability to water will be. But if you have access to a faucet, use it. Hand washing, in my mind, is something that will never go out of fashion.